Unique concept for a swing door whereby during the opening process the door pivots and slides to one side and then sits between both rooms. Also the opening function can be dampened to avoid slamming as an optional extra. Door can also open in both directions. Residential & Commercial pedestrian doors where space is a premium. Aluminium black anodised top track, 4 wheel hanger with nylon wheels, dampener within track and pivot rod made from steel. Various sized kits are available and are listed below. When ordering please use the Technical details to correctly ascertain the kit you need. 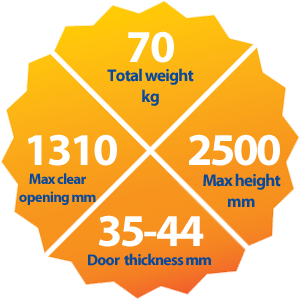 Further options are available such as height adjustable rods for doors above 1981mm high upto 2500mm high, a soft open system and profiles for the side jambs. Should you wish to order any of these options please call the office.